Yep, I'm one of those weirdos that buys life size medical skeletons during the summer at garage sales. But, do you want to see what we did with them? Inspired by these genius's, ours doesn't even come close, but it was still fun thing for my Halloween crazed 9 year old and I to do together. The Mr. and Mrs. were missing their heads. The Mr. was missing his thigh bones and the Mrs. was missing one of her arms. Nothing a little trip to the attic couldn't fix. We literally rummaged through our "bag of bones" and found some that looked like they would do. A couple styrofoam heads, and they were complete. I hope we don't freak our new neighbors out. See, told ya he loves Halloween!!! I usually don't like the skeleton, sometimes "dark" theme in Halloween. Your skeleton decorating though is the best and the most fun I have ever seen! Love seeing your nine year old having fun and being creative too! 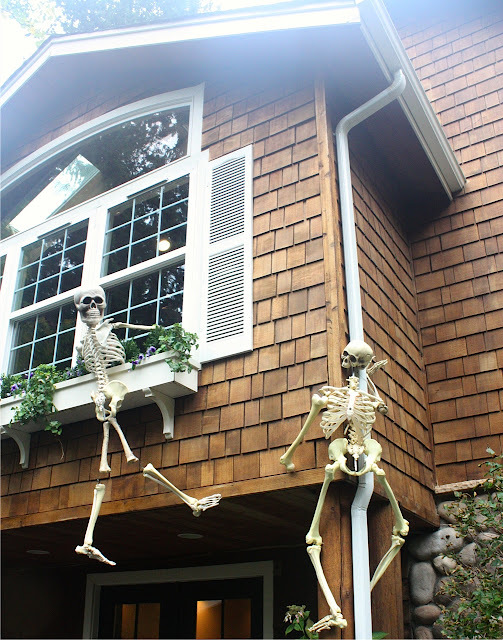 We SO wanted to do something like this this year but we couldn't find the skeletons. I love your display! Love it! Cody looks like he is enjoying them too. Looks great! We can't do the scary Halloween this year because my 2 year old is too freaked out! What are the names of those gorgeous flowers in you window box? Love it! 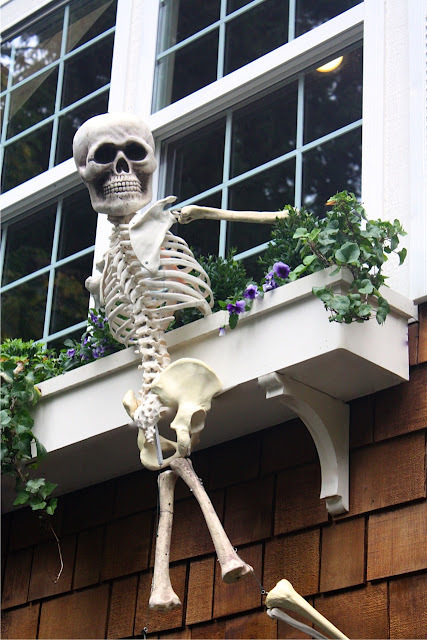 We use "bag of bones" to decorate for Halloween too! I've taken heat for it, but to those people I say "lighten up." 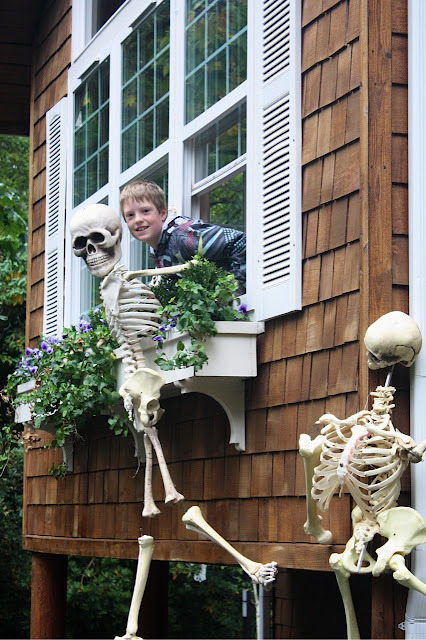 We love Halloween and get tons and tons of adorbale trick or treaters. Cute! Melaine, what is the color of your siding stain. love it! 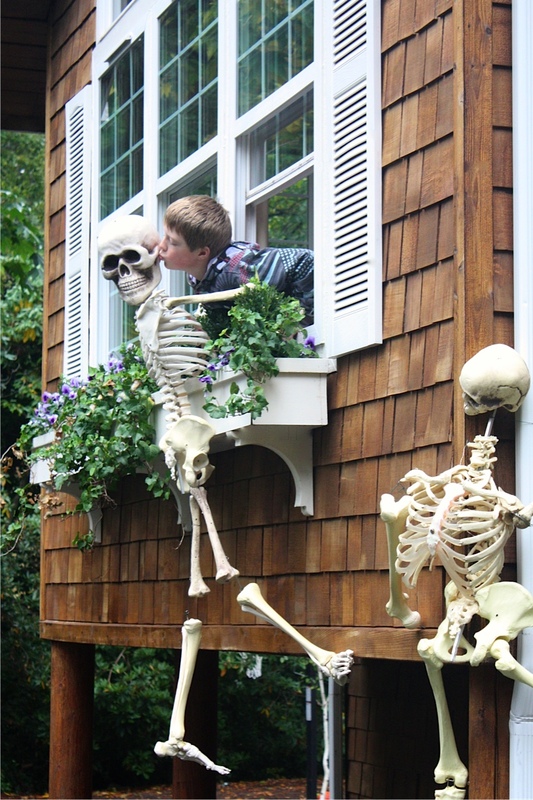 I adore the skeletons! I wish we had some to hang on our house :) Such a great idea! You certainly have them in some unusual poses.